The project “Bird Park Josefovské louky” (Josefov Meadows) is located in the north-eastern part of the Czech Republic in Hradec Kralove region in arable land area and was founded in 2008. 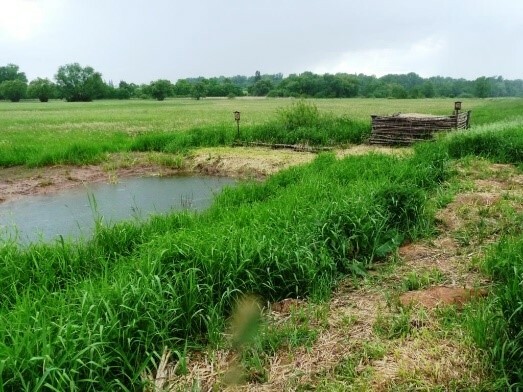 The aim was to create appropriate conditions for return of wetland birds and amphibi-ans to the meadows in the floodplain of the river Metuje and to enable people to appreciate the beauty of nature - the motto is "Park for birds and for the people". The idea was promoted by a local amateur ornithologist, who proposed restoration of one part of the original hundred years old unique irrigation system in some 70 ha grasslands lo-cated between Old and New Metuje river. The aim was to create a bird private reserve. In the past, the floodplain of the whole river Metuje was often flooded and there was created a system of irrigation channels to support grassland production in dry seasons. The abandon-ment of irrigation system led to decline of waders in the locality. In terms of ornithology and botany, the site was not valuable at the beginning of the project (source: Czech Society for Ornithology). Decline of livestock production in 90s led to low demand for grass in the region, therefore farmers produce hay for unstable market, and without CAP support this activity would not be economically viable. The project focuses on : 1. restoration and increasing of biodiversity, joint with alluvial meadows and wetlands, especially wader birds and amphibians, and 2. educational benefits for public. As secondary effect, there is 3. benefit of cultural experience with restoration and using of former irrigation system, unique in the region. But there is a dilemma: increase of biodiversity relying on increase of ground-water level and visits of tourists negatively influence conditions for farming. The restored irrigation system is in hands of NGO and not in hands of farmers, which cause uncertainty on the influence of irrigation to farming (e.g. farm operations). Therefore, there is a problem of sustainability of water management and long term coopera-tion of project leaders with farmers, who manage the meadows. The farmers are motivated to manage grassland mainly by CAP payments (limited demand for hay). The project leaders (NGOs CSO and CSOP) indicated, that without CAP support, and farmers in area, they can im-agine to manage the area themselves, but the improvements of the site would be much slower, and the sufficient fund rising much more difficult. the management of the meadows and recreating lost habitats. The case study represents a relatively small area and number of stakeholders based rather close to the wet meadows. The studied socio-economic system provided much more environmental and social benefits after the collective action was initiated and several actions were carried out because of that. The leaders of the collective action succeeded to meet the local/regional demand of especially biodiversity/landscape en-thusiasts and it provided sufficient financial funds for the investment in the site. The collective action helped to renew the traditional values and supported the environmental education in the region. The policy measures played an important role and the collective action leaders orchestrated their support to create especially new habitats, facilities for visitors, and to renew the old irrigation system of a high cultural value. If there was no demand for biodiversity in the intensively farmed regions between inhabitants and biodiversity enthusiasts, it would be difficult (if possible) to carry out most of the capital work, which was possible to carry out only on own land (e.g. habitats for birds like pools or wetlands). But it was necessary to address this demand, to gain the trust in the project, and the relevant actors to turn the demand to actual support. The demand is growing and will be supported further by a targeted promotion of the activities and events in the site, and espe-cially of the results – provision of ESBOs to the inhabitants, school children, and biodiversity enthusiasts (e.g. additional organised visits, new facilities for bird watching, better presenta-tion of actual achievements related to support). The purchase of land in this case limits the transferability, but the lessons from the project in terms of trust and engagement are highly transferable. The presence of agri-environmentclimate support under the CAP provided a strong incentive for farmers resulting in a rapid improvement of the site. Thanks to the enthusiasm of the local ornithologists, relevant NGO s and volunteers, who put a lot of effort into the Bird Park creation, donors were convinced to support the project. The project manager is a well-known and trusted individual for all the key local stakeholders, because he has lived in the region for a long time. of trust and appreciation amongst regional biodiversity enthusiasts and the local population alike. The main drivers of grassland management are CAP (Single Area Payment Schemes and Agri-Environmental Climatic Measures) and partly programs of Ministry of Environment. Drivers for the project sustainability are enthusiasm, good knowledge and communication skills of the leaders, and good marketing of environmental and social benefits. The main institutional changes consisted of: acquisition of part of the grassland by NGOs, creation of working group and the agreement between NGOs on the common approach, agreement with farmers on the grassland management, agreement on restoration of irrigation system and also between users of water (a small water power plant is also involved). The partnership is quite strong (e.g. trust, reciprocity, values sharing) between NGOs and relevant bodies on mezzo level (e.g. local government), but weaker with farmers, who fear of the consequences of regular ground water level increase, and late cuts on their meadows (the demand for grass is low but new management of the site could make farming more difficult).